Nobody knows better what Lviv nightlife is rather than students. Nobody knows better what clubbing all night is and sleeping 2 hours rather than students. Nobody knows better what the best parties in Lviv Metro Club are rather than students. That’s why for you, who are open-minded and active, future doctors and managers, professors and businessmen, Metro club prepares STUDENT’S PARTY. The interesting contests, valuable gifts, giving VIP cards and go-go show Art-BiZz are waiting for you! With flyers free entry till 00:00 (if you represent appropriate student card ). 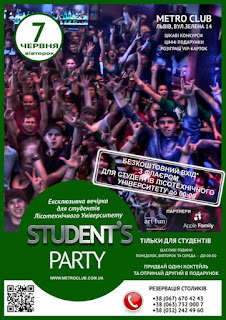 With just student card free entry till 23:00. For ladies 22 years old and older free entry during the night. Getting free entry is possible just with id card. Ніхто не знає краще, що таке нічне життя Львова, ніж студенти. Ніхто не знає краще, що таке гуляти цілу ніч і спати дві години, ніж студенти. Ніхто не знає краще, що кращі вечірки Львова проходять в клубі "Метро", ніж студенти. Тому саме для Вас, вільних і активних, майбутніх лікарів і менеджерів, професорів і бізнесменів, нічний клуб "Метро" започатковує “Студентську вечірку”. дівчатам старше 22 років безкоштовний вхід протягом ночі. НАЯВНІСТЬ ДОКУМЕНТІВ, ЩО ЗАСВІДЧУЮТЬ ВІК ТА ОСОБУ - ОБОВ'ЯЗКОВА!!!! !/ It's obligatory to have the documents which verify your age and identity!!!! !